Is your Happy Diwali a Safe & Healthy one too?! What a joyful occasion Diwali is, with all communities coming together to celebrate a unique social festival! There’s a lot of light, and cheer and new clothes and flowers and festivity and food of course! Here are 10 tips for you to celebrate, stay safe and stay healthy this Diwali. Sweets are hard to resist and during Diwali, it’s even harder isn’t it!? Indians are genetically prone to diabetes and so it is always safer to keep sugar and starch intake minimal. Sweets that use chemical preservatives should be avoided because they damage our kidneys and liver. and may also cause asthma attacks and cancer. Use organic sugar and sugar substitutes for best results! Avoid sweets that have ‘silver’ coating. Such foils are often adulterated by aluminum and aluminum being a hazardous metal can accumulate in our body tissues and can also enter the brain. Firecrackers are fun, but they increase air and noise pollution. It is good to buy as little firecrackers as possible, because that can help us spend less and can also stop us from polluting our environment. While using firecrackers we are definitely faced with the risk of burn injuries. Do take a few precautions. Always wear slippers when playing with firecrackers and always light them only from a safe distance. Kids should be allowed to burn firecrackers only under adult supervision. If you do get burnt, organic and natural aloe vera products soothe your skin and help quick healing. Do not light firecrackers in crowded areas or on the roadsides, because that might prove to be dangerous for bystanders and the general public. Wash after playing with firecrackers with natural handwash. Organic soaps are a good option as well. If possible, wear earplugs while exposed to explosive firecrackers. It is really safe, for the excessive noise might damage our ears in the long run. Use facewashes to stay fresh in the polluted environment. It is better to say ‘No’ to alcohol, as any excess is easily possible on this day of celebration. You can avoid a hangover and also the risk of driving while intoxicated if you must drive your car and visit your friends and family. Diwali is a festival that brings a lot of gifts to people, so use the occasion to choose sensible gifts for family and friends. Just log on to www.naturalmantra.com for great gift ideas and offers every day this festive season!!! Diwali is also the festival of joy. Make it special for your family or friends. Wish them a ‘Happy Diwali’ and embrace them in joy! Make your Diwali special for yourself, your family and your friends. Categories: Did You Know?, Eco Living, Health, Healthy Recipes, Positive Energy, Sustainable Living | Tags: #Burns, #Celebrations, #Crackers, #Environmental, #Firecrackers, #HappyDeepavali, #HappyDiwali, #Heal, #Noise, #NoisePollution, Celebrate, Diwali, environment, gifting, gifts, pollution | Permalink. Are you leaving behind bins of food-print on the environment? Think. Eat. Save! What does this phrase mean to you? If you are abreast with current-affairs, you would know that this is the theme for 2013’s World Environment Day. It is an anti-food waste and food loss campaign that encourages you to reduce your food-print. According to the UN Food and Agriculture Organization (FAO), every year 1.3 billion tonnes of food is wasted. At the same time, 1 in every 7 people in the world go to bed hungry and more than 20,000 children under the age of 5 die daily from hunger. If food is wasted, it means that all the resources and inputs used in the production of all the food have been wasted. Wastage of food is the largest single driver of bio-diversity loss and land-use changes. To do your bit towards the conservation of the environment, make arrangements of left-overs to be given to charity while holding a banquet or a mass celebration. Making an informed decision on your next grocery buy will also go a long way. Select foods that have less of an environmental impact, such as organic foods that don’t use chemicals in the production process. A little thought about what you eat can help you save the environment. Begin this journey with Natural Mantra! Check out our range of healthy, natural and organic food products that will help reduce your food-print on the earth. It is a small but crucial step towards a better and more abundant tomorrow. Are you ready to take this step along with us? In our fast paced lives, a sustainable lifestyle shouldn’t be a struggle, but it sometimes is. Our online e-commerce provides the largest selection of natural, organic and eco-friendly products in India making it accessible and affordable to all. Founded by parents, NaturalMantra.com helps you choose from a wide selection of safe, healthy non-toxic products, all at one place delivered to your door! Not every product makes it to NaturalMantra.com but the ones who do make it through our selection criteria. Categories: Natural Mantra | Tags: Celebrate, conservation, environment, environmentally friendly, food, footprint, healthy, healthy living, hunger, natural resource, poverty, save, sustainable lifestyle, sustainable living, UN, waste, world | Permalink. Mother’s Day – Return her priceless love with a Mother’s Day Gift! This poet has definitely struck the right cord and conveyed the most important message, that our mother means the world to us! She dedicates her entire life to make us what we are and we get just one day, Mother’s Day, to acknowledge her. Not fair, is it? But nevertheless, this is her day, this is the time she deserves the best attention and care from you! 1. Luxury Spa Collection – This collection contains the best of organic & natural spa products by Puro Body & Soul, including icy blue body wash, freshly scented aqua candles, relaxing massage oil, meditation incense sticks and embroidered face towel. With this collection, she can rejuvenate her senses and if she doesn’t want to visit a spa, this is the perfect gift for her! 2. Mother’s Day Combo Pack – This combo pack consists of floral fusion body splash, peach lip butter and citrus blast scrub again from Puro Body & Soul. Keep in mind that these products have been specially selected by the experts for Mother’s Day, so your Mom’s sure to love it! 3. Anti-aging Pack – She will always be too busy to notice the signs of ageing and even if she does, she won’t do much about it. So it’s up to you to help her remain as gorgeous as ever. 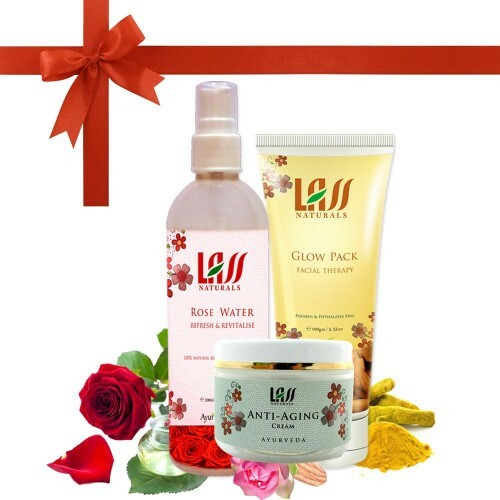 For that, you can gift her this anti-aging pack from Lass Naturals, which is a chemical-free and effective solution to achieve wrinkle-free and glowing skin. This amazing combo pack contains Anti Aging Cream which reduces appearance of wrinkles and age spots, naturally. 4. OG Mama Products – On Natural Mantra, you have a wide variety of OG Mama products to choose from, and the best part is that to celebrate the auspicious event of Mother’s Day, OG Mama is offering 20% discount on all its products! 5. Gift Certificates – If you belong to the I-am-so-confused fraternity, then the best gifting option for you is Natural Mantra’s gift certificates. These certificates range from Rs 500 to Rs.3000 and the best advantage gift certificates endow is that your mom can get the gift of her choice! Now that we have given you the finest gifting options, we hope that you make this Mother’s Day the most memorable one ever – for her and for you! Categories: Natural Mantra | Tags: Ageing, Celebrate, Gift Certificate, gifting, Greeting, Love, Luxury, Mother, Mother's Day, mothers day gifts, natural, Organic, Spa, Special, Unconditional Love | Permalink.